H.O.M.E. ... time for a change.. I was tired of it... unenthused by my outdated colours...and style..
and feeling suffocated by the amount of stuff I no longer needed...or wanted. I decided I needed a huge cull....a de-clutter...a change to a simpler style and a spruce up. I began by a huge clean out... bags and bags of 'stuff' marched out the door to the Op shop...every time the kids pulled up I loaded their car with some more things to take away. I was overwhelmed and had no idea where to begin....I loved so many looks...so many ideas...and I found it hard to narrow them down to just one style...plus I was adhering to a tight budget. I enlisted the help of my dear friend Janelle... who waded through piles of ideas... pictures..and suggestions to help narrow down my style. and in the mean time I began the hard labour. First job was to paint all of my walls white....argh!! It seemed not that long ago I madly added colour...and now oh how I regretted that...covering those dark turquoise walls took many coats. I also removed all my timber blinds... and culled some unwanted furniture. I slowly noticed in the last few weeks a shift in the pins I was pinning...and the magazine pages I was ear marking....I had unintentionally settled on a style that I obviously loved the most. I'd say it is a simple and earthy style. with "what could I do here?" and she has patiently sent me links... and ideas.. and kicked started many of my ideas. 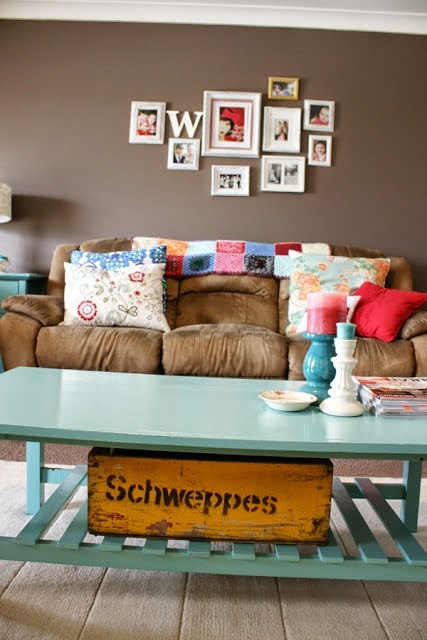 but I would love to share my decor journey here on my blog. It can be a place to jot down my thoughts...finds and DIY's along the way. Mardi, I'll definitely be following along with your decor journey...I'm at a similar stage myself...I just want to get rid of almost everything and change, change, change....will be really interested to see you ideas in action! I have often noticed your references to simplifying Mel.... it is such a good feeling isn't it. I think for me...I couldn't have a home without character....but I don't need any excess either. Oh and pinterest has been my worst habit lately...but also the source of my best ideas...I love it. You stuck with me though. You have a natural talent with design . and the patience of a saint.